What do cows in India, Mexican bugs and Egyptian mummies have in common? If you said, “Rembrandt,” give yourself a cigar. Most of us, when think of color, think in the abstract. Color is the spectrum or the rainbow. Or the deciding factor in which car we buy. We think we know what “blue” means, or “yellow,” but that doesn’t say what blue or what yellow. Just an abstract approximation. But for an artist, color is pigment, and pigment is ornery, peculiar and sometimes toxic, sometimes distressing, even morally questionable. Poet William Carlos Williams wrote in his book-length Paterson, “No ideas but in things.” It was the total anti-Platonic declaration of faith in the here-and-now, the lumpy, gritty, quotidian things we can feel with our fingers or stub our toe with. I paraphrase his dictum with “No color but in things.” This is not abstract, but palpable. A painter cannot simply decide on green or yellow, but on what pigment that paint is made from. Each acts in its own way, mixes with others differently, dilutes differently, requires a different thinner, binder or medium, displays varying levels of permanence, transparency and glossiness. The painter cannot think in abstract hues, but in the actuality of the physical world. Hands in the mud, so to speak. 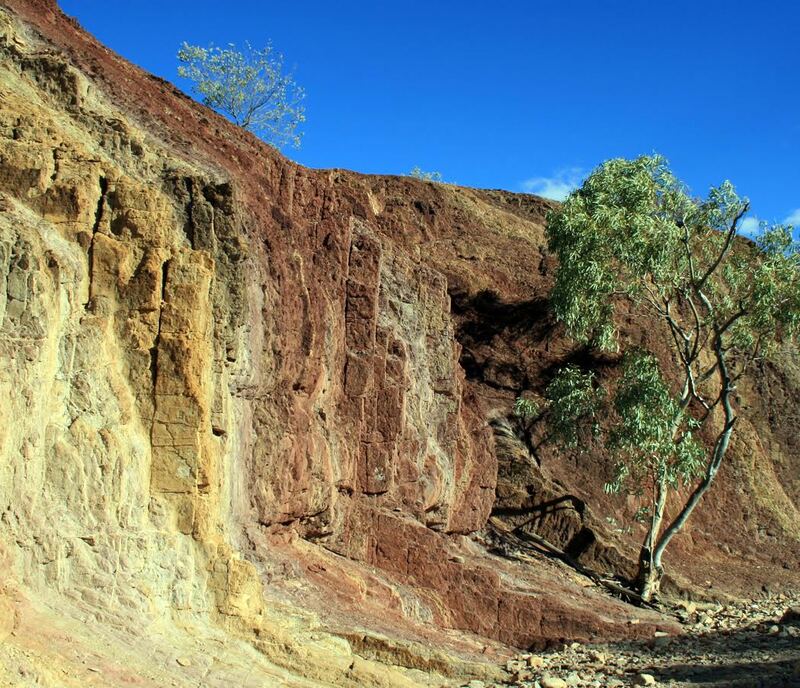 The earliest pigments were dug from the earth or sifted from the cook-fire: Ochres and soot. 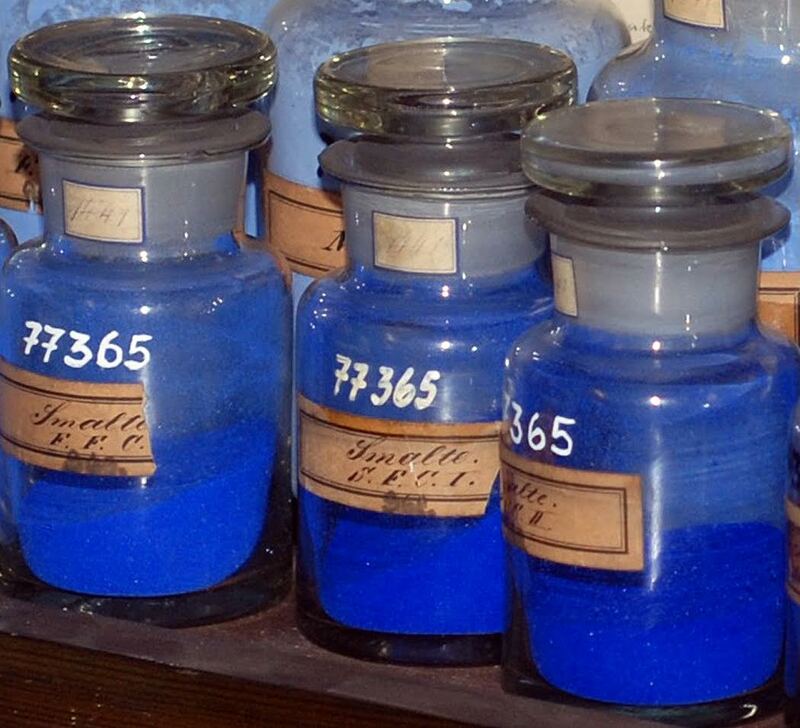 The caves of France and Spain were painted with these pigments. They had to be worked into submission by the artist, grinding, mixing, adding medium and binder. His — or her (we cannot know for sure) — hands got dirty in the process. There was a smell to it, fresh loamy smell or the acrid residue of the hearth. 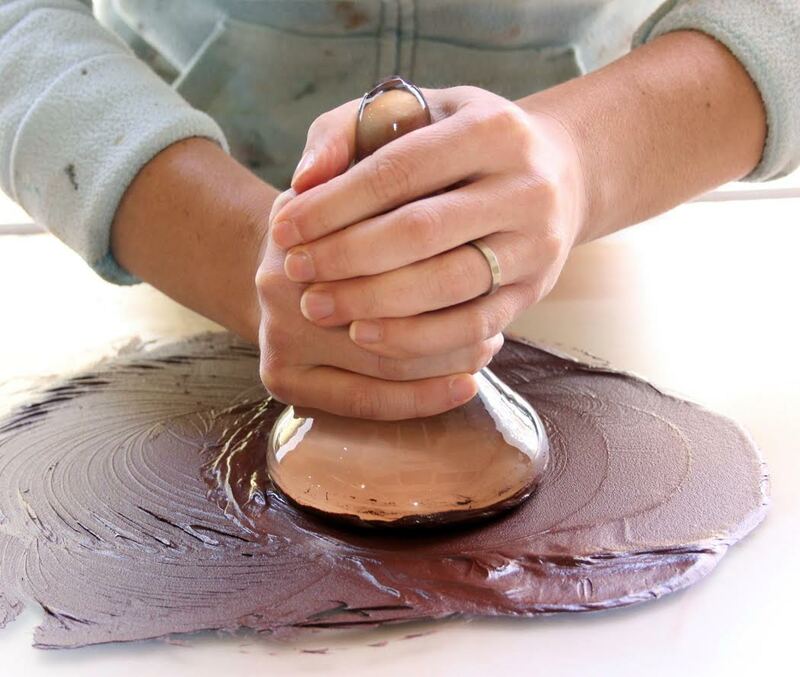 There was a feel, gritty or pulverized, oily, or smudgy like moist clay. So, until the mid-19th century, all paints were made from the things of this world. Soils and rocks, plants and snails. 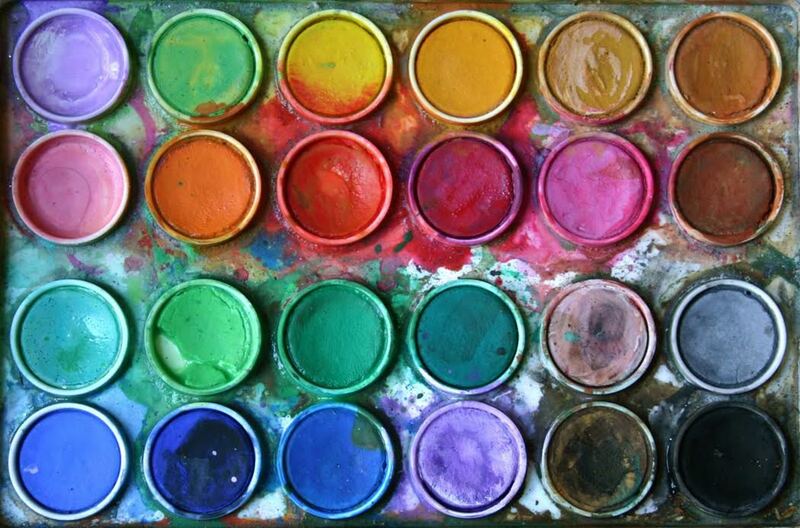 Each pigment had its idiosyncrasies and those had to be reckoned with when mixing them or placing them side-by-side. None was pure, save, perhaps, the blackness of soot. A decade later, the German chemists Carl Graebe and Carl Liebermann, working for BASF, synthesized alizarin crimson, making an artificial pigment that matched the natural alizarin dye that had been extracted from the madder plant. It was the first color created from an element of coal tar — a byproduct of turning coal into coke. “Apres moi, le deluge” — Since then, there has been a flood of synthetic colors, all devised in the laboratories of giant corporations. There are the aniline dyes, the azo dyes, the phthalocyanine dyes, diazonium dyes, anthraquinone dyes — a whole chemistry lab of new industrial color. Many of these new dyes and pigments were brighter and purer of hue and more permanent (not all: the new chrome yellow that Vincent Van Gogh used developed a tendency to turn brown). 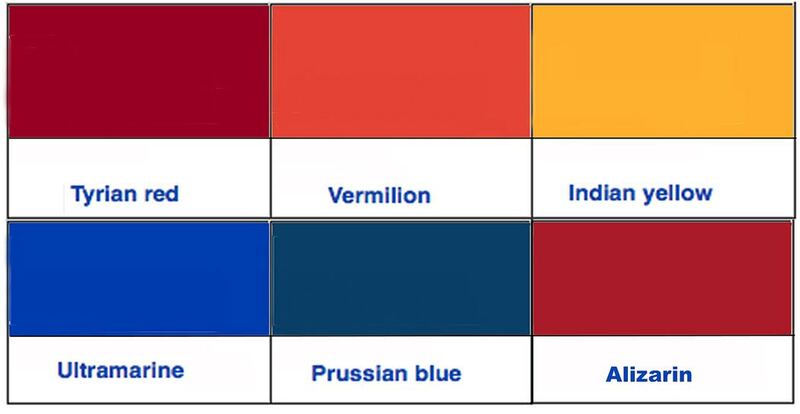 Nowadays, even oil and acrylic paints with traditional names, such as burnt umber and ultramarine are likely to be produced industrially using chemical derivatives. But that shouldn’t blind us to the fact that Rembrandt or Michelangelo had to arrive at their paints through laborious and time-consuming processes. Most pigments came to the artist’s atelier in the form of a rock or a sediment. It had to be ground down to a powder, a process normally done by an apprentice — basically an intern: “Bring me a latte, a bearclaw and the powdered cinnabar.” Being ground to a grit wasn’t enough; the poor apprentice sometimes had to spend days with the pigment between grinding stone and levigator or muller, working it into pulverized paste that could be mixed with a binder and medium and finally used by the artist on canvas. It wasn’t until the advent of the industrial revolution and the invention of a pigment-grinding machine in 1718, that the tedious work of pigment making became doable in large quantities. And it wasn’t until the mid-19th century that prepared paints, sold in zinc tubes, made it possible for artists to buy portable paints they could carry out into the countryside to paint in the open. But we should not forget the sometimes ancient origins of the paints used for the canvasses of the Renaissance, the Baroque — the Old Masters. This is where the Indian cows, the Mexican bugs and the Egyptian mummies come in. 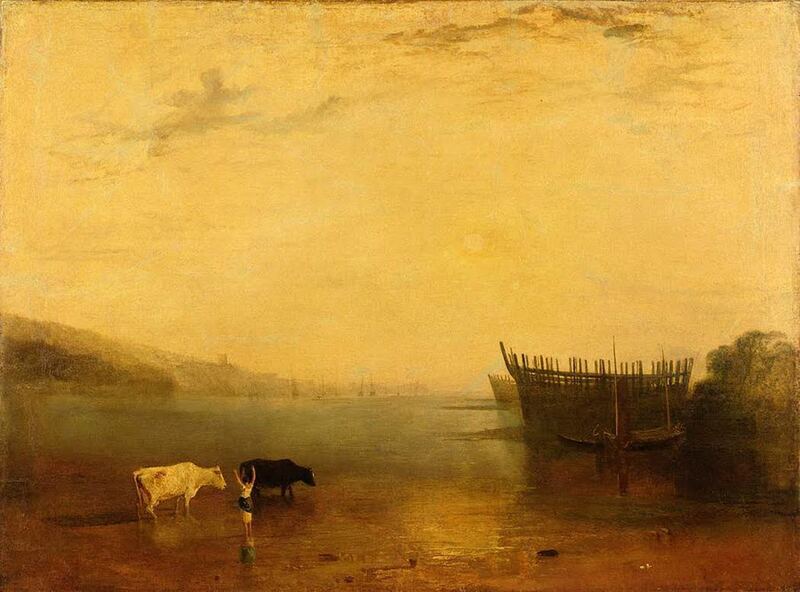 First, let’s look at a few of the standard paint-sources from this pre-industrial age. Many of them have wonderful and memorable names, now largely gone out of use. Bice — Is a dark green-blue or blue-green pigment made from copper carbonates, primarily the mineral azurite, sometimes malachite. Lightened, it was often used for skies. Carmine — This is the Mexican bug I mentioned above. The cochineal scale insect grows on certain cactuses in Central and South America. It is a bright violet- to deep-red color. The Aztecs called it “nocheztli,” which means “tuna blood,” and dyed the tunics of Aztec and Inca royalty. Cinnabar — A scarlet red form of mercury sulfide and highly poisonous, it was mined in Europe, Asia and the New World and was used also for cosmetics and medicine — hardly a wise use. See also: Vermilion. Crimson — Before the Conquista, a European scale insect, growing on the kermes oak, provided a red dye. It was less efficiently grown and produced than the cochineal of Mexico, and so was replaced. Michelangelo used it in his paint. Dragon’s blood — Mentioned in a First-Century Roman travel guide (a periplus), it is a maroon-red pigment made from the sap of various plants, most notably theDracaena cinnabari. Medieval sources wrote that it was made from the blood of actual dragons. 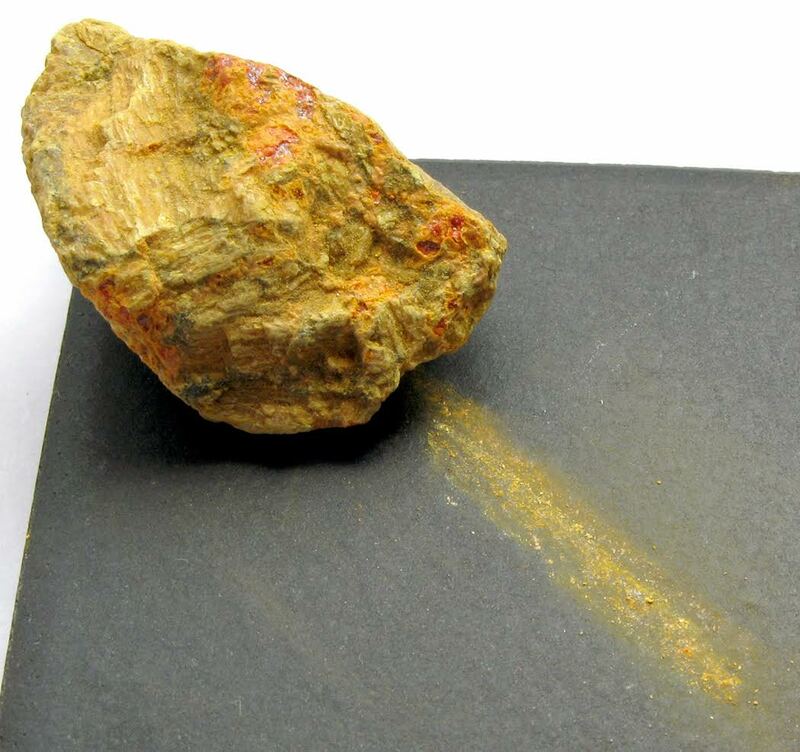 Gamboge — A yellow pigment formed from the sap of the Cambodian gamboge tree (genus Garcinia). Coincidentally, the name comes from the Latin name for Cambodia. Madder — Another dye that goes as far back as ancient Egypt, it is a violet to red color extracted from the Rubia tinctorum and related species, plants that grows on many continents, and in southern France is called garance — for those of you who love the great French film Les Enfants du Paradis. It is turned into a pigment from a dye by the process known as “laking,” and so often encountered as madder lake. Minium — Also known as red lead, this orange-red pigment was commonly used in Medieval illuminated manuscripts. It was made by roasting oxidized lead in the air to form lead tetroxide. Sepia — a dark brown to black dye and pigment extracted from various species of squid. Most popular as an ink, it has also been used for oil paint. Smalt — First used in ancient Egypt, it is a cobalt oxide use to color glass a deep blue. The glass is then ground into a powder used as a pigment. Tyrian purple — This is the purple of the Roman emperors, and is extracted from a mucous secretion from the hypobranchial gland of a predatory sea snail found in the eastern Mediterranean. It was worth its weight in silver and it might take 12,000 snails to produce enough dye for a single garment. Ultramarine — The ultimate blue, made from the mineral lapis lazuli, found almost exclusively in Afghanistan, which, for Europeans, was “beyond the (Mediterranean) sea” or “ultra-marine.” The process of making the pigment from the mineral was complex and the final color was so highly prized, and so expensive, that its use had to be expressed in the contract commissioning a painting by Renaissance artists, less they use some less costly, and less glorious blue. Verdigris — A green pigment formed by copper carbonate, chloride or acetate. It is the patina on the Statue of Liberty, but in oil paint, it has the odd property of being initially a light blue-green and turning, after about a month into a bright grass green. Vermilion — First synthesized in China in the fourth century BCE, the bright red is mercuric sulphide and depending how well powdered it has been ground produces hues from orangey-red to a reddish purple that one writer compared to “fresh duck liver.” It is also produced by grinding cinnabar. The finer the grinding, the brighter the red. Painter Cennino Cennini in his 15th century Craftsman’s Handbook wrote: “If you were to grind it every day for 20 years it would simply become better and more perfect.” It is also highly poisonous, but was the most common red in painting until it was replaced in the 20th century by cadmium red. Viridian — A darkish blue-green pigment, a hydrated chromium oxide, popularized by Venetian painter Paolo Veronese. You will have undoubtedly noticed how many of these pigments were poisonous. It has certainly been suggested that Van Gogh’s madness may have been caused by his habit of tipping his brushes with his spit. The most common toxic color through history was white, which was most often lead carbonate, or flake white, aka lead white. It was easy to manufacture by soaking sheets of lead in vinegar for weeks at a time and scraping the resulting white powder off the surface of the metal. Flake white was a wonderful, opaque and brilliant white pigment. Unfortunately, it could kill, blind or make mad those who used it. Even today, older houses have sometimes to be de-leaded of their original paint in order to be sold legally. Children are especially vulnerable. A substitute for white lead was looked for. Zinc white — an oxide of zinc — was tried, but was not as opaque or as white. Nowadays, titanium white is used, safer and nearly as good a pigment. But, as I said at the top of this article, some of the old pigments were not only dangerous, but morally questionable. Ivory black — made from elephant ivory, and essentially ivory charcoal, it is (or was) an intense black pigment. Nowadays, it is most often made from bones, as bone black, aka Mars black. Indian yellow — A pigment brought to Europe from the east, it was described as being made by feeding cows solely on mango leaves, which made their urine an intense yellow, which was then evaporated into a sludge, dried and sold. The cattle were severely malnourished by this diet, and the practice outlawed. There are those who doubt this explanation of the pigment, but no one doubts the strong stench of the bolus. It is no longer made. Mummy brown — A bituminous brown, made from ground-up Egyptian mummies, both human and feline. Popular from the 16th century, it was good for “glazes, shadows, flesh tones and shading.” In the 19th century, the supply of Egyptian mummies was so great that in England, they were used as fuel for steam locomotives. But when the actual origin of the pigment became widely known, a moral repugnance swept England and the Pre-Raphaelite painter, Edward Burne-Jones was horrified to find out what he was using, “and when he heard what his brown was made of, he gave all his tubes of this color a decent burial” in his garden. Makes you look at all those rich, warm browns in Rembrandt with a slightly different eye.